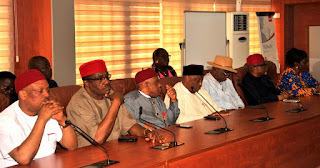 Senator Biodium Olujimi led an Ad Hoc Committee of the Senate, including Senator Enyinnaya Abaribe (Abia South) Senator T.A Orji (Abia Central), Senator Mao Ohuabunwa (Abia North), Senator Barnabas Gemade, Senator Samuel Anyanwu and Senator Sonni Ogbuoji, that paid a visit to the Governor of Abia State, Dr Okezie Ikpeazu at the Government House in Umuahia. 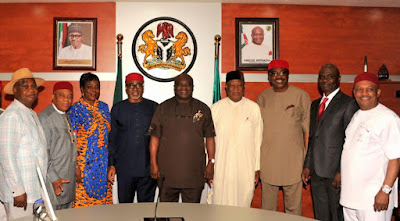 Speaking on behalf as her colleagues, Senator Olujimi, who expressed the felicitation of the Senate President, Senator Bukola Saraki, to the Governor, said that the Nigerian Senate is solidly behind Dr Ikpeazu as Governor of the state. The senate also condoled with the state over the deaths of Chief Ojo Maduekwe and Senator Onyeka Okoroafo. “The authentic and indomitable Governor of Abia State, Dr Okezie Ikpeazu, we are here with the consent of the Senate President and Chairman of the National Assembly, Distinguished Senator, Dr Bukola Saraki, and on behalf of the Senate of the Federal Republic of Nigeria, to condole with you and the entire people of Abia State in this trying times. First over the political situation in Abia and over the death of your illustrious sons, Chief Ojo Maduekwe and Senator Onyeka Okoroafo.